Glasgow City, Hibernian, Rangers and Spartans all progress to the SWPL Cup semi-finals. Scottish champions Glasgow City beat Celtic 4–0, Spartans put five past Motherwell, Rangers defeated Forfar Farmington 4–1, while current holders Hibernian won 6–0 against Stirling University. Glasgow City, who are looking to win their first SWPL Cup since 2015, progressed to the semi-finals after a 4–0 win against Celtic, who have been runners up in the competition for the past two years. Despite a couple of early opportunities for the visitors, it was City who took the lead in the 24th minute, when former Celtic striker Kirsty Howat set up Hayley Lauder, and the Scotland international fired a great effort from the edge of the area into the top corner of the net. Soon after it was Clare Shine's turn to get on the scoresheet with a fine volley that found the top corner of Meghan Cunningham's net. Shine got her second in the 33rd minute, when she tapped home from close range after Nicola Docherty saw her strike parried back out by Cunningham. The last goal came in the 52nd minute, when Megan Foley got on the end of a Docherty cross, effectively ending Celtic's hopes of progressing to the semi-finals. Debbi McCulloch's side reached the last four of the competition with a convincing 5–0 victory over Motherwell at Ravenscraig. The visitors opened the scoring in the 10th minute, when Scotland U19 international Tara McGonigle gained possession in midfield before sending a though ball to Zoe Johnstone, who slotted it home. Beth Mckay then proceeded to score twice in six minutes for the visiting side, before completing her hat-trick in the 22nd minute. 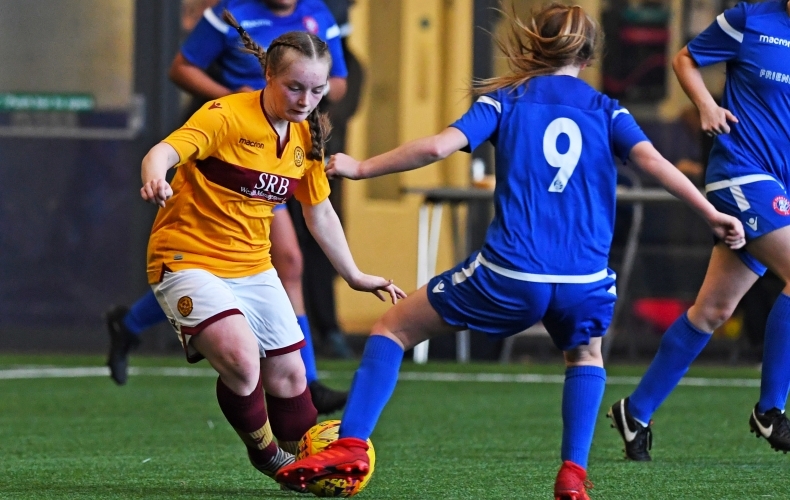 The fifth and last goal came just six minutes later, when McGonigle sent another through ball out wide to Sarah Clelland, who skipped past the Motherwell defender before cutting it back to Johnstone, who tapped home her second of the game. A goalless second-half ensured a place in the semi-finals for the visitors, who will now face their Edinburgh rivals, Hibernian – against whom they drew 0–0 in their home opener two months ago. Treble-double winners Hibernian have once again made it to the semi-finals of the SWPL cup after beating Stirling University 6–0 at Ochilview Park. Hibernian captain Joelle Murray opened the scoring in the 7th minute, when her cross found the back of the net. A Ciara Bonner own-goal in the 12th minute doubled the visitors' advantage, and then Jamie-Lee Napier made it three just eight minutes later. Defender Siobhan Hunter got her name on the scoresheet in the 30th minute, and the visiting side went into the break with a four-goal lead. It was 5–0 in the 61st minute, when Amy Gallacher forced another Stirling own-goal. The sixth goal came in the 76th minute, courtesy of new signing Ashley Fish. After a lively start to the game, Rangers were awarded a penalty after Nicole Pullar was brought down in the box. Rangers captain Clare Gemmell stepped up and converted the penalty to put her side ahead in the 17th minute. In-form centre-half Hannah Coakley then made it 2–0 in the 43rd minute, when she slotted home from a Gemmell corner. Pullar scored Rangers' third goal just three minutes after the re-start, after Carla Boyce played in Chantelle Brown, who cut the ball across goal for Pullar to tap home. Forfar Farmington managed to pull one back in the 71st minute through Danielle McGinley, but Boyce extended the hosts' lead ten minutes later, when she fired home the rebound from Hayley Sinclair's shot.